Striking Combination of Beauty and Color! 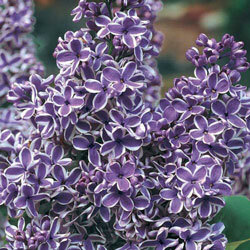 This lilac is unlike any you've ever seen! Deep purple blooms are edged in white and grow in huge trusses up to 10" long. Enjoy the classic lilac fragrance as it perfumes the entire area, while the gorgeous flower panicles delight butterflies and hummingbirds alike. Erect branches make for excellent cut flowers. As its deep green foliage remains attractive all season, use as a border, hedge or mass planting for greater impact. Drought tolerant. Planting Instructions: Set at same soil level as in container, firm and water well.